Chic layering is where I'm at, at the moment. Layering sleeveless knits over stripped and patterned shirts puts a fashionable spin on regular knits over regular shirts. (We've seen it all before!) Although this look does suit an every day vibe, simple swap the jeans for a pair of cropped cigarette pants and you've got yourself a work ready look. Flared jeans are a proper leg lengthener. Don't be fooled into thinking they are just for the tall and slender. I'm merely 5"3 and how insanely tall, not to mention how long to my little legs look!? Pop on a block heeled boot for the day and slip into a strappy sandal to take you into the evening. Absolutely, perfect layering. Those kick flares are stunning. Gorgeous outfit! 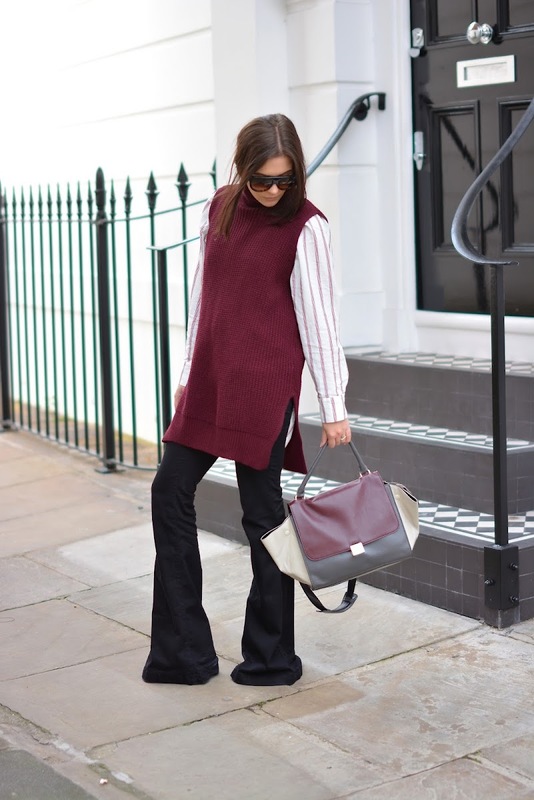 Loving how you have styled those fabbbb flares! Wow these pictures are fabulous! Ah I love everything about this outfit. I wish I had such effortless style. Looking really cool in those flare jeans! Great layering! Love the knit over the shirt! those trousers are awesome, you're really workin' this outfit, love it! Loving the knit paired with the flares. Thinking I might just well have to give flares a whirl! I don't know if many of us can pull off this outfit. It looks great on you!